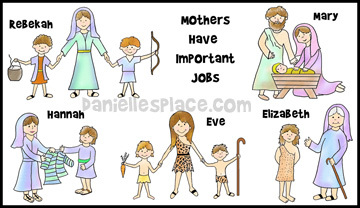 The following crafts and activities come from the Bible lesson "Mother's Are Imp-ortant Too" on The Resource Room, a members-only site for Sunday school teachers. It is also available as an instant download. This lesson is appropriate for 4th and 5th grade. 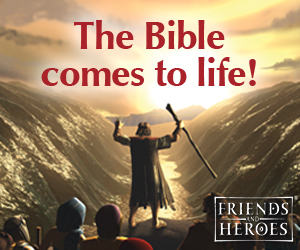 Teaching Concept: There are many stories in the Bible about important people and events such as the creation of the world and God sending his only son to save the world from sin, but sometimes we forget about the important women in the Bible and the roles they played in God's plan for the world. Mother's day is a great day to think about how these mothers might have felt. This lesson is taught using a series of pictures (or one picture) of five mothers and sentence cards that describe each mother. (Each picture is available in color or black and white, and can be used as coloring sheets.) Before class teachers print out the pictures of the mothers and staple them to the bulletin board. In class children take turns picking one of the sentence cards, reading it and placing it under the appropriate picture. Children think about and share how they think these mothers might have felt. Patterns available in black and white and in color to be printed on legal-sized paper. 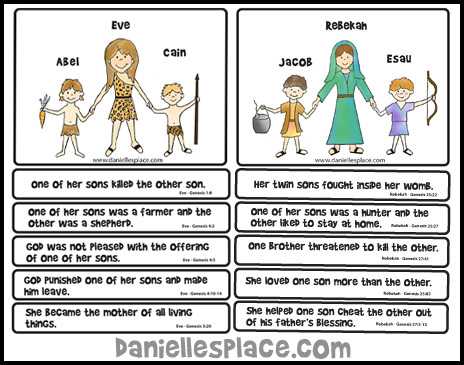 The teacher assigns groups of children Bible references about different mothers. The children read the stories and then act out the story from the mother's perspective for their classmates. 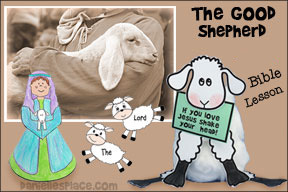 The teacher or a student reads short paragraphs written from the Bible mother's perspective and the students try to guess who the paragraph is describing. 1. Before class print out the patterns on to card stock or printer paper. 2. In class have your children color the patterns, cut them out, and then tape them together. The mother is taped together in the front and the child in the back. Fold up the feet. 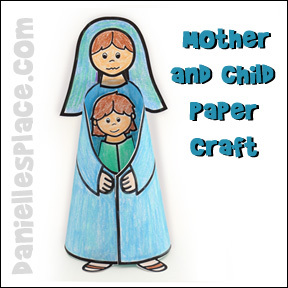 The child paper doll can be placed in the mother's arms by bringing it up through the bottom of the mother paper doll. 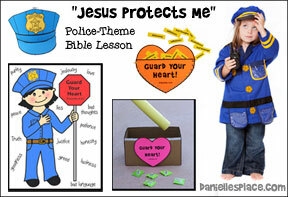 In this lesson children learn what it means to love someone and how to express their love to their mothers. Many objects are used such as candy, a clock, a compass, a measuring tape and others, to represent different ways our mothers show us love. These objects are also used in a memory game to review the lesson and to study the Bible verses that go with this lesson from 1 Cor. 13. Before class write at the top of the board "What Your Mother Does to Show You She Loves You". Under the title write the numbers one through five. Tell your children as they walk in that you are going to have a contest. Give them each a piece of paper and tell them to write down the numbers one through five on their papers. Tell them that you have a list of the five most mentioned things that mothers do to show us that they love us. You want everyone to write down what they think are the top five things that they think the people surveyed have picked. The student that gets the most right will get a prize. 1. She tells me she loves me. 2. She hugs and kisses me. 4. Spend times with me. 5. She takes care of me. 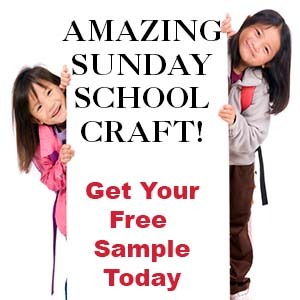 All of the above crafts and activities including a complete lesson are available to members on The Resource Room and as an instant download for $2.95. I can tell your love for me is true. I thank God He gave me you. I love you through and through." 1. Print out the pattern onto printer paper. 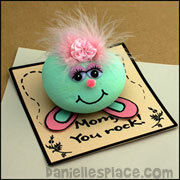 Instant Download Lesson $2.00 - - Includes 1 Pattern as shown. 2. Color the pattern with markers or colored pencils and then cut it out. 3. Glue the circle onto a paper doily and then glue the doily onto a pretty piece of construction paper. 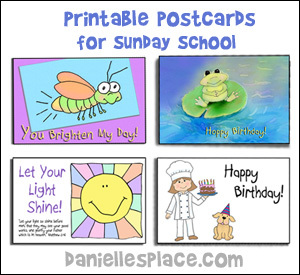 Instant Download Lesson $2.00 - - Includes 2 patterns, one with words and one without. 2. Color the pattern with colored pencils or markers. 3. Write a letter or poem to your mother. This craft has a sign saying "Mom, thank you for taking care of me" hanging down from the bottom of the picture." (Sign not pictured.) This craft is available to members only. 1. Print out the bird pattern and sign pattern onto heavy paper. 2. Collect leaves and press them in a heavy book between sheets of waxed paper. Collect some dried grass or straw. 3. 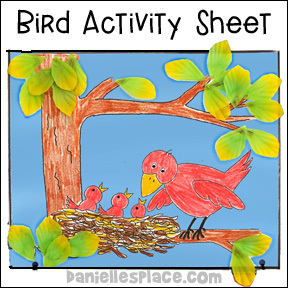 Color the picture and then glue dried leaves on the branches and grass on the nest. 4. Cut a hole on each side of the mama bird's beak. Cut a piece of brown pipe cleaner about 2 to 3 inches long and stick in through the hole to make it look like the bird is holding a worm. 5. Cut out the sign and tape or tie it to the bottom of the picture. 1. Before class draw a picture of a vase at the bottom of a piece of paper and make copies. You can also let your children draw their own vase. Or you can use the vase pattern. 2. Prepare the silk flowers and leaves by pulling them off the stems and removing any plastic parts. 3. Give each child a piece of construction paper and the vase pattern. Show them how to glue the vase to the construction paper. Have them draw stems coming out of the vase. Then have them glue on some leaves and then the flowers. Finish with buttons, pompoms, or other decorative items. 4. Help the children write a message to their mom or other caregiver. 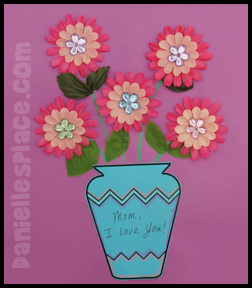 See the Mother's Day Page for craft ideas. 1. Play "Simon Says" but Use "Mother Says" instead - Our three year olds loved this game, and they all wanted to take a turn being the mother. 2. Practice being a good mother - Bring in baby dolls, clothes, towels, wash cloths, soap, diapers, etc. Show the children how to take care of a baby. "I'm Going to Help My Mom (maybe)"
I'm going to help my Mom 'cause today is Mother's Day. I'll help to cook and clean and I won't go out and play! Are you okay without me Mom? ~ it's an EMERGENCY! There is someone that I love best! And Mommy is her name - o. And Mommy is her name - o . If you like this song, consider purchasing "Praise 4 God ~ Just 4 Kids©" a collection of more than 75 simple songs and poems of praise.